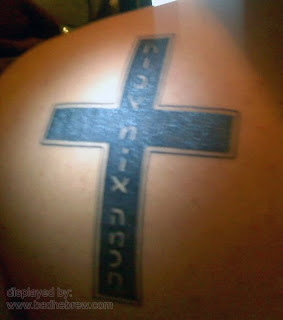 I've had quite a time deciphering this recent Hebrew tattoo that was kindly pointed out to me by Reut. Can you guess what it says? Well, the first word that stands out is the one on the bottom, "Hochma" - wisdom in Hebrew. Yes, it's written backwards, but if you've been reading this site long enough you're surely used to that mistake by now. The middle word made me scratch my head and wonder what's going on. It sort of reads "Hioa" which isn't a real Hebrew word. In fact, it is supposed to be "Ometz" - courage. The letter Vav has nikkud attached for reasons unknown, making it look like two letters, the Mem looks very much like a Het and the Tsadi drifted up and attached itself to the next word! Oh yeah, and it's backwards too. The word on top, "Koach" - strength, is backwards and has the leftover Tsadi from the previous word, making it into gibberish. All in all, this is a tattoo designed to draw out a "HUH?" from any Hebrew speaker. Luckily, the letters can be easily blacked out and the whole thing forgotten. The victim made one wise choice regarding this tattoo - he made the background black! Mind, I wrote it out horizontally. If you're planning a vertical tattoo, remember that Hebrew is written right to left, and so the rightmost letters go on top. The only thing I don't understand is how this person turned the letter 'mem' into what looks like an English 'N'. But then I recently had a customer with a תמשל tattoo that she wants to change because someone told her it somehow looks like the word "Swan". I guess Hebrew letters must look really different to non-Hebrew speakers. the last word looks like "sect" rather than "strength". Is this true? You mean the last word of what I wrote? While the letters ARE similar, what I wrote is a Het, not a Tav that a Sect (Kat) would have. The difference between a Het and a Tav is that the letter Tav wears a shoe on its left leg.